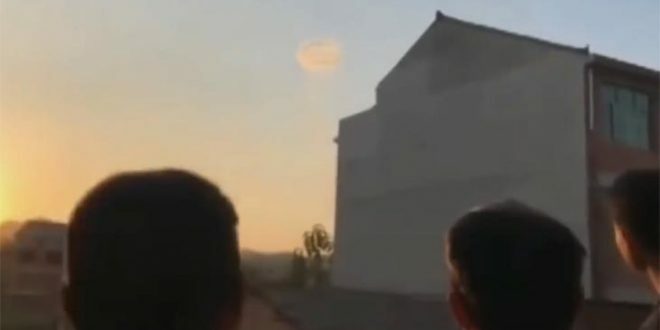 Unusual footage has emerged from China of an UFO-shaped cloud appearing in the sky. In video captured in Shangrao City in Jiangxi Province, southeastern China on November 2 by onlookers, a cloud with the appearance of smoking ring can be seen. According to local reports the cloud appeared for more than 10 minutes before disappearing. No further information was available at the time of writing. Similar sightings have been reported previously where a black smoke ring was seen in the sky above Jinshitan beach in Dalian, China’s Liaoning Province on August 12. It has then been confirmed that the ring-like cloud was shot out from a canon for performance purpose. A black ‘smoke ring’ was also spotted above the M62 near Birkenshaw in Yorkshire in July but later it’s been said to be a byproduct of cannon fire of a battle reenactment at the nearby Yorkshire Wartime Event. Ya that’s called a cloud.